Are you in there, patty ? what could possibly be behind such a site? is someone serious about this? is it generated by a Japanese bot? They are mania-actu since quite a while. Entered phrase "zooz" in google and the second option was this: https://www.facebook.com/toomanyzooz. Such a weird name for a band. Guess it's some weird band anyway. 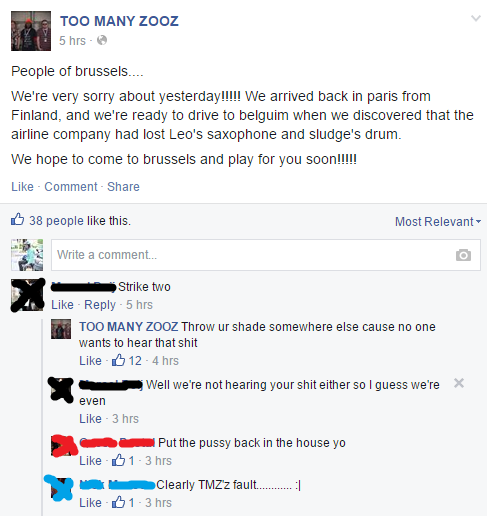 (sorry Zooz, I'm not meaning to offend you in any way). That band was already noted on this forum: viewtopic.php?p=46724&hilit=Too+Many+Zooz#p46724 Pr0 dancing starts at 0:48 then 1:14 then probably more.